Despite having established that God is actually within everyone all the time, we still forget His omnipresence in and around us rather easily. To understand this dilemma, consider how during a solar eclipse, something comes in between us and the Sun, completely blocking the light, even if only for a short time. Yet, even such a bright object as the Sun can be covered up, plunging the Earth into darkness. So too, in every person, in addition to the body and the mind with which we all are familiar, there is also a spiritual heart, the seat of God. God shines brilliantly from the heart, brighter than a thousand Suns in fact. However, there is an agency that can nevertheless create an eclipse, blocking this light, sometimes altogether. That agency is the devilish force, using lust, greed, jealousy, anger, hate, pride, arrogance as its principal agents. As Krishna says in the Gita, this force that is capable of generating a lot of evil lurks in the darkest corners of the mind. In short, although God resides in the heart of all, the mind can easily make man forget this vital fact. Unfortunately, that happens often, and that is the root cause for most of the problems facing humanity today. When we forget God, we suffer from spiritual ignorance or ajnana. Can this ignorance be removed? Yes it can and the simplest way is to seek out and submit to a Guru or a teacher. There is common belief that a Guru imparts jnana or wisdom to the disciples. I used to think so too, but where spirituality is concerned this is absolutely wrong. As far as worldly knowledge is concerned, sure a teacher teaches us subjects like mathematics, physics, etc. But when it comes to spirituality, the Guru plays a different role. This has been made clear by Krishna and later clarified through a beautiful drama by Shirdi Baba in His conversations with Nana, who thought that Baba did not know Sanskrit and therefore the contents of the Gita. Where spirituality is concerned, what worldly Gurus can do at best is to remove ajnana or spiritual ignorance. That is to say, they help dispel the clouds that prevent natural, self-radiant light to shine from within. This is where buddhi or the intellect comes into the picture. Gurus help us to develop buddhi or spiritual discrimination. Once this discrimination begins to operate, then the clouds of ignorance disappear and we are able to see God within, as also listen to His voice, ever ready to convey advice. The voice within is the voice of the conscience, as it is sometimes referred to. 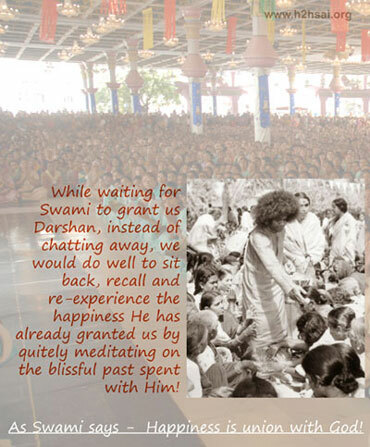 As many may know, Swami speaks in a very soft voice. Thus, when He is in the interview room, the people outside who chant the Vedas do so in a low voice because they do not wish to drown the voice of Swami. as the conscience or the divine voice in our spiritual heart. This maxim assumes great importance in the present context, when we are discussing the issue of listening to the conscience or the voice of God speaking from within. What does the phrase “depths of silence” actually mean? Are there any sources of noise within that must be shut off, and if so what are they? Swami says that the noise within arises mainly from the mind, which is constantly chattering. It is in the nature of the mind to constantly chatter in ordinary persons. Swami says that if you watch a crow, you will find it is constantly turning its head from one side to the other; so also, the mind is constantly flitting from one topic to another, ever restless. This perpetual restlessness of the mind and its never-ceasing random thoughts generate “noise” that come in the way of our listening to our conscience. Just try this experiment. Try to chant a long prayer with full concentration, especially one whose words you already know. You will find that soon you begin to chant automatically, since you already know the words. Meanwhile, the mind begins to wander and you are not able to concentrate fully. This is the natural tendency of the mind. Even in sports, I have heard top performers say that when the going is good, their body plays automatically while the mind flits around. Of course, when there is a crisis or a desperate emergency, the mind does tend to focus sharply but by and large, it is the usual tendency of the mind to drift randomly. 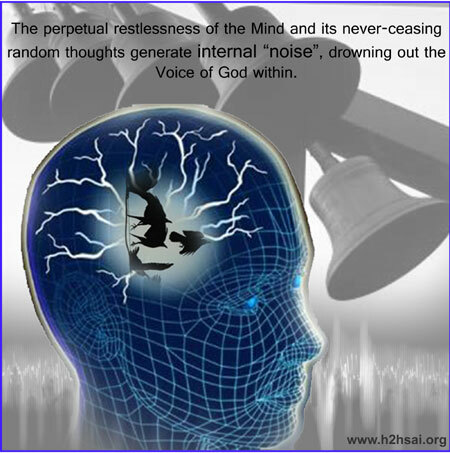 It is that constant random talk that generates internal noise, often drowning out the voice of God or the conscience from within. It requires a certain amount of dedicated discipline to keep the mind on track and one of the easiest practices for this is to constantly chant the name of God. On the face of it, this might not seem a great idea; one might argue that in this case also the mind would wander; it sure will but the wandering would be in the domain of God, which saves the day – a person who is constantly chanting the name of Sai would start thinking of Swami, His darshans, the times He accepted their letter, and so on. All these help, because they tie one more firmly to the source of purest love than do worldly matters. The final injunction is certainly not a trivial one. In this context, I must recall an incident involving the venerable late Mr. Gopal Rao who passed away after completing a century. One morning some years ago, when devotees were dispersing after morning darshan and bhajans, I found someone tapping me on my back. I turned and found it was Mr. Gopal Rao. Now this was a rather tough question and so I said, “Sir, I would have to think about it. Why don’t I get back to you, say tomorrow?” Mr. Rao granted me the time to think and we went our ways. Next morning, there he was ready to nab me, and without waiting for any preliminaries, he straight away asked, “So what’s your answer?” I replied, “Sir, I have been thinking about it and this is the way I feel. After all, why do we perform rituals, chant a thousand names of God, etc? To become one with God. Likewise, most of the people gathering near the water cooler and chatting away in the darshan hall are people who have had wonderful experiences with Swami earlier. They can easily settle down in silence and enjoy the happiness of union with God by meditating on that blissful past. The voice of God from within and in person can then be heard loud and clear. The universe, as all of us know, is bound by space and time. Space is the stage where events happen, and time is the marker that tags events along a freely flowing timeline. Science categorically tells us that this universe of ours had a definite beginning, 13. 8 billion years ago, to be precise. What about God? Obviously, He being the Creator, must have existed even before the universe came into existence, even as a mother has existence before the child is even conceived. In the Gita, Krishna makes this very clear by referring to UNMANIFEST DIVINITY that exists even when there is no manifest universe. That unmanifest divinity is what we usually refer to as God. This God is definitely abstract and eternal. Beyond that we cannot say much, although we can definitely surmise that this God is the real source of all virtues like compassion, selfless love and forbearance. Vedanta refers to this supreme entity as Parameshwara, Brahman and so on. It is also called the atma. I presume that different religions that speak of a formless and abstract God do indeed have this entity in mind, and give it names like Allah or Jehova. Its now time to jog our memories regarding the foundation of the Awareness series. We must live in the awareness of the presence of God everywhere, in everything and at all times. Next, we must understand the mechanics of creating this awareness of the omnipresence of divinity. No doubt God is present in us as the energy of every single atom; but that power in us will not help us to develop awareness. No doubt God is present in us as the life force or praana but that alone too would not help to develop awareness; if that was the case, then donkeys and camels would have turned spiritual long ago. Humans alone have that ability because God is present in humans at a third and higher level, as the conscience or the divine voice in our spiritual heart. As a part of becoming aware of the cosmic omnipresence of God, we must first become aware of the conscience within. It means that we must still the mind, and open the pipeline called buddhi. Once buddhi is sparkling clean and ready for business, then we can dial the conscience anytime. Becoming aware of the presence of God within and learning to consult God on all matters of truth and righteousness is the first step. This step is a must and cannot ever be bypassed. It is only after this that one becomes equipped for the next step to become aware of universal consciousness. What is that step? On matters relating the birth of our Universe and its subsequent evolution, science has a lot to say and we do know quite a bit about the early universe and about the evolution of living species as well. But the question remains, where did all this come from in the first place? Science has no answers for that though there are some speculations. Vedanta on the other hand, declares firmly, that creation came from the Creator because He willed it. In the language of this talk, one could say Creation was born out of Pure Universal Consciousness, and the Universe so created has the fingerprints of God all over. 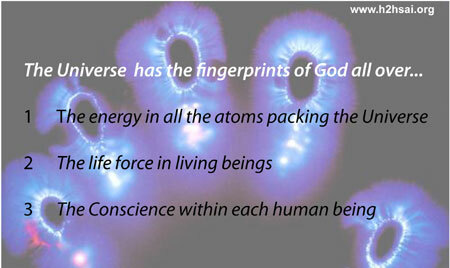 One fingerprint is the energy in all the atoms packing the universe. Another fingerprint is the life force in living beings. And the third fingerprint is the conscience within each human being. These fingerprints as I refer to them, are not visible which is why most scientists would dismiss any reference to God as regards life force and conscience. Where atomic energy is concerned, agnostic physicists might say, “It has nothing to do with God; it is all about E = mc2, that is all.” Well, why mc2 and not some other law? Is there a superior force that ordains the laws of nature? That is where the debate becomes endless and we shall not get into that bottomless pit. Individual conscience is an aspect of God specific to individuals, acting as an internal and personal advisor. Its source is the Universal Consciousness. There are billions of individuals and each one has a conscience; are they all different or parts of the same? The conscience present in different individuals may appear individual-specific but it is all a part of ONE Universal Consciousness, from which our universe and everything in it came into existence. Realising this is what awareness is all about. In other words, individual conscience and Universal Consciousness are one and the same; one is the micro aspect and the other is the macro aspect. One must cognise both, and that is important. Long time ago, Krishna clarified this question with a rather simple answer. Each individual may think he has his own personal advisor within; operationally, that is true. However, conscience everywhere speaks the SAME language and gives the SAME advice. This should not be surprising when we remember that conscience is the voice of truth and righteousness. As Swami tells us ever so often, there is only one truth and nothing like this fellow’s truth, that fellow’s truth, Indian truth, Pakistani truth and American truth. Good question and we shall now consider precisely that. The term individual conscience is true at the operational level where it appears to be individual-specific. However, we must not fail to understand that what we refer to as conscience is really God, the indweller, and that God is omnipresent, in particular as the indweller of all beings. That is why Swami has reiterated that there is no such thing as your atma, someone else’s atma and so on. At the working level, this is a very important point. Consider a person who is very upright and ethical. He is faced with a situation where he has to choose between his son and his neighbour’s son. At that point, he might well say that he would prefer to help his own son rather than that of his neighbour. You might argue that this is inevitable, as his duty as a father. Fair and fine so far. However, at the cosmic level, this amounts to a decision based on considerations of the body and not of the atma. The moment you begin to talk of my son and his son, the vision is restricted. That may be fine as far as worldly considerations are concerned, but at the post-graduate level in spirituality – and that is what true awareness is all about – decisions based on the impermanent aspects are inadequate. So it all boils down to this. One must not only meticulously follow one’s conscience but also be aware all the time of the fact that the so-called individual conscience is merely a “component” of Universal Consciousness. 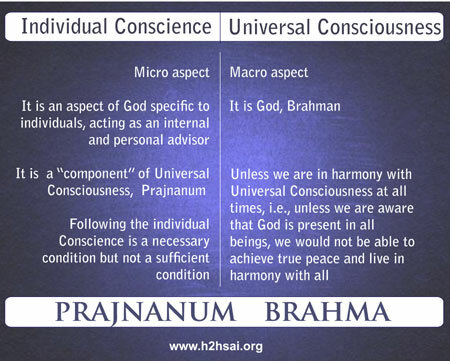 Individual conscience and awareness is referred to in Vedanta as Prajnanam and Universal Consciousness as Brahman. This Cosmic identity that I just referred to is enshrined in the Vedas in the dictum: Prajnanam Brahma! Meaning that individual and Universal Consciousness are in fact just one and the same. In other words, at the highest level in spirituality, actions must always be performed keeping this universal truth in mind. shut out, then that person can become the very devil. Unless we are in harmony with Universal Consciousness at all times, we really cannot feel one with all. In other words, if we fail to be aware that God is present in all humans and all beings, we would not be able to achieve true peace and live in harmony with nature. Is there God in a murderer? If so why does he commit murder? If God is Omnipresent, why is there so much evil? Recall first that God is present in humans at three levels; the gross, the subtle and the causal. God is so present in all, including in a murderer. Humans have no control over the presence of God at the first two levels. However, when it comes to the third and the highest level, humans can shut out the divine effulgence. If that effulgence is allowed to shine, the person becomes a saint. If, on the other hand, that effulgence is shut out, then that person can become the very devil. So, God IS present in the Heart of the murderer too, but unfortunately, that person chooses to be guided by his misguided mind, ignoring God within. Please note that God does not and will not thrust Himself upon us. He will certainly make Himself available to us, but if we say no thanks, then we have only ourselves to blame. To understand this argument better, imagine a big river across which there is a huge dam. The dam is meant to store water, and water gets stored when the dam shutters are closed. Downstream, one may see a dry riverbed, but that is because water is not allowed to flow. If the shutters are opened, then the river would not run dry at all. In other words, God is present even in a murderer, but that person is not allowing the latent divinity to manifest itself. There is a surplus of evil in the world because humans are too busy to allow the divinity a chance to express itself. God being eternal, exists both when there is a Universe and when there is none. When there is no manifest creation, He exists in the form a Pure, Abstract Oneness, that is not easy for us humans to describe, bound as we are by the experience of Space and Time. But sages have recognised this supreme state of existence through their meditations, and Krishna has confirmed God existing as the unmanifest divinity. When God creates the universe, it is not as if He disappears from the state of unmanifest existence to come down to the universe and hide Himself there in various forms and aspects. He now exists in two states; that of unimanifest divinity as usual, and as the immanent God in all creation. In Creation, God is present everywhere in gross matter, as the energy of the atoms. In living beings, He is present in an extra aspect as the divine life-force. In humans beings, He is present in a still higher aspect as the conscience or the voice of God. Life, Swami often says, is a precious and rare gift. It is given not to be frittered away in various pointless pursuits but in becoming aware of the omnipresence of divinity and conducting ourselves in the light of this awareness. More specifically, we must first realise that we have really descended from God, then appreciate that so has everything else in the universe, from the mountain to the ant, and finally lead our lives seeing God everywhere, in everything, all the time. Jai Sai Ram.